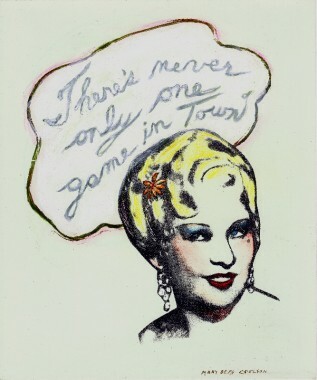 Mae West - There is Never Only One Game in Town, 1997, mixed media on jute tag, 12" x10"
Right in the Kisser, mixed media on jute tag, 12" x 10"
Scoring Yourself/ Class Action, mixed media on jut tag, 12" x 10"
This month the Bernstein Gallery is highlighting the work of Mary Beth Edelson who is internationally recognized as a founder of Feminist art, and for her social and political activism, which began in the 1960s and continues today. Edelsons artwork comes in various media: painting, prints, sculpture, photo-based work, video and performance. The works on display at the Bernstein Gallery focus on her drawings and prints. There will be a panel at 4:30pm at Bowl 016 with the reception at the Bernstein Gallery directly following at 6pm. Panelists include: Eve Aschheim, Artist and senior lecturer in the Visual Arts Center at the Lewis Center for the Arts, Princeton University; Judith K. Brodsky, Artist, Professor Emerita in the Department of Visual Arts at Rutgers University, and co-founder of the Rutgers University Institute for Women and Art; Jill Dolan, the Annan Professor in English, Professor of Theater in the Lewis Center for the Arts, and the Director of the Program in Gender and Sexuality Studies, Princeton; Stanley N. Katz, moderator, Professor of Public and International Affairs, Woodrow Wilson School, Princeton University. Through her work Edelson provokes with sassy wit and visually re-writes Hollywood scripts by appropriating images of actresses such as Judy Garland, Marilyn Monroe and Mae West. These film stars are taken out of the context for which they are best known and re-imagined as wily, independent women. For example, The Young Judy Garland series depicts the actress as a caricature of herself with a big head and small body surrounded by text that urges women to challenge the male authority in their lives. Edelsons work has been featured in more than 90 books and is widely reviewed in the United States and abroad. Her work is in the permanent collection of many museums including: the Guggenheim Museum, New York, NY; Walker Art Center, Minneapolis, Minn.; National Museum of American Art, Washington, DC; Museum of Contemporary Art, Chicago, Ill.; Detroit Institute of Art, Indianapolis, Ind. ; Museum of Modern Art, New York, NY; Seattle Museum of Art, Seattle, Wash.; Malmo Museum, Sweden; and the Sammlung Verbund, Vienna, Austria. The Woodrow Wilson Schools Bernstein Gallery and Annex are part of the Bernstein Lobby, dedicated in 1991 to the memory of Marver Bernstein, first dean of the Woodrow Wilson School, and his wife and collaborator, Sheva Bernstein. The space presents four to six exhibitions a year which stimulate thinking about contemporary policy issues ranging from human rights, world health and education to war, national security, poverty and politics.